Digital Editions of Flying Models for iPad, iPhone, iPod Touch, Computers, Laptops, and More! Now you can purchase single issues and manage your subscriptions with the easy-to-use CarstensMags app. Download our free app to get started today! Subscribe to digital editions using your home computer or laptop! Carstens Digital Editions can be read on any Adobe Flash enabled web browser for Mac or PC. ﻿Adobe® Flash Player® is a free software plug-in for your web browser. Already a subscriber to our print edition? Add digital for only $10.00 more. Want to convert your existing print subscription to a digital one at no extra cost? Contact us for details! Read about our Digitial Edition advertising opportunities! Q. What is a Carstens Digital Edition? A. Carstens Digital Editions are an electronic version of our printed magazines. The electronic version is delivered in a format identical to the print version. A digital edition is considered more environmentally friendly due to the reduction of paper and energy use. In addition, you will also enjoy easy article searching and bookmarking, hyperlinks within the publication to other resources, supplemental content such as video and animation, and direct links to advertisers and their products (where applicable). You'll also be able to share article clips with your friends! With our free CarstensMags app, Carstens Digital Editions can be read on your Apple® iPad™, iPhone™, or iPod Touch™. You can also read Digital Editions on your home computer or laptop. TRY A FREE PREVIEW OF OUR DIGITAL EDITIONS! Q. What if I don't own an iPad or any other mobile digital device? A. If you don't have a tablet computer or other mobile digital device, don't worry! You can subscribe to Carstens Digital Editions and read them on your home computer or laptop! You won't need any special software, just a web browser like Internet Explorer™ or Firefox™ equipped with the Flash Player plug-in. Q. What about Android mobile devices? A. If you have a Flash-enabled web browser on your Android device, you can read Digital Editions. Q. Where do I go to read my Digital Edition? A. If you are reading your digital editions on a mobile device like an iPad, download the free CarstensMags app. You will be prompted for your login information to download issues in your subscription, or you can purchase single issues. 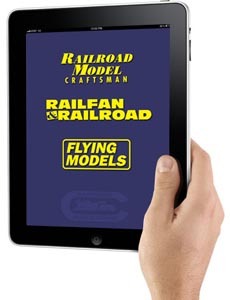 If you are subscribed to digital editions on your computer or laptop, go to your magazine's home page (rrmodelcraftsman.com or railfan.com or flying-models.com) and click on "Current Issue" to read your digital edition. Back issues are available under the "Archive" link. Q. Which magazines will you make available as digital editions? A. Our three monthly titles (Railroad Model Craftsman, Railfan & Railroad, and Flying Models) are now available as digital editions. All three are available through the CarstensMags app, which can be downloaded for free from the Apple App Store. You can also subscribe to instantly read editions on your home computer or laptop! Q. Do you sell digital edition single issues of your magazines? A. Single issues can be purchased through the CarstensMags app, which can be downloaded for free from the Apple App Store. Q. Do you sell digital edition subscriptions of your magazines? A. Digital subscriptions can purchased through the CarstensMags app, which can be downloaded for free from the Apple App Store. You can also subscribe to instantly read editions on your home computer or laptop! Q. Can I buy a gift subscription of the digital editions? Q. I am an existing print subscriber. Can I get a copy of the digital edition without paying extra? A. Unfortunately, no. Currently, you can download our free trial issue to try out the product. When you renew your subscription, you can choose to receive both a print and digital edition for a small additional charge. Q. How can I view previous issues of Carstens Digital Editions? A. If you are a paid subscriber to the digital edition, you can only access the issues for your subscription period. For instance, if you have a one year subscription to Railfan & Railroad, which is published twelve times a year, then only those twelve issues will be available to you from when you start your subscription. It's the same as if you bought a print edition in that you would only have access to those issues you have paid for. Download the FREE CarstensMags app from the App Store to read digital editions on your iPad, iPhone, or iPod Touch! Purchase single issues and manage your subscriptions, all from one convenient app! Get started today!